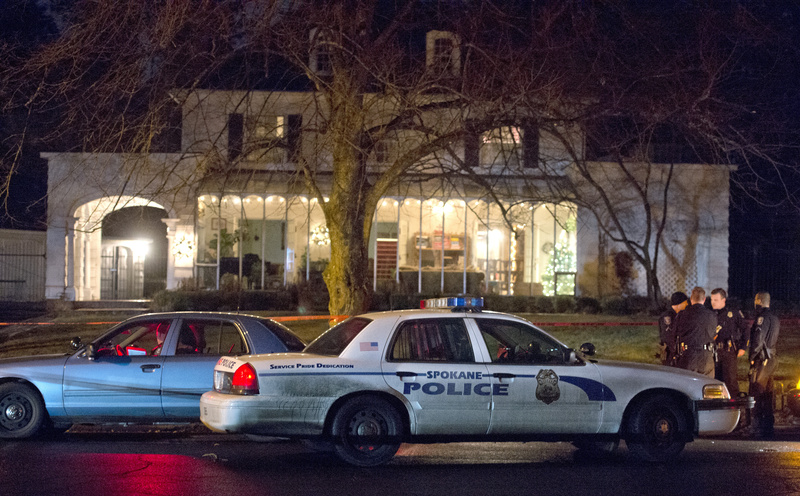 UPDATED: Mon., Dec. 16, 2013, 4:53 p.m.
A fatal shooting that sent dozens of police officers to a quiet neighborhood on the South Hill and put several blocks on lockdown does not appear to be a random act, police said Monday. “We don’t have these types of incidents in Spokane, where someone comes into somebody else’s house and just shoots them,” Spokane Police Capt. Joe Walker said of the Sunday night attack. Early information suggests “the victim was targeted,” Walker said. The victim’s identity, however, is still being withheld by authorities. KHQ News is reporting that the attack may be linked to a business dispute involving the victim’s dealings in North Dakota. Police responded to a call of a shooting in the 2500 block of South Garfield just after 7 p.m. Sunday. When they arrived on scene, they found an occupant shot to death inside the home at 2505 S. Garfield Road, just a few blocks from Hutton Elementary School, Walker said. The victim was declared dead at the scene and his or her identity has not yet been released. A call to dispatchers Sunday night came from a woman inside the house who said her husband had been shot. Police have not confirmed these reports. Walker called the investigation “frustrating” because it bucked the usual investigative process of homicides in the area. Usually the police would have a suspect in custody by now, he said. Instead, police have only released a vague description of the assailant - a white man wearing dark clothing. The investigation, which lasted through the night and wrapped up at the scene shortly before noon Monday, had little effect on the school day at Hutton, Spokane Public Schools spokesman Kevin Morrison said. Morrison said the school has taken steps usually referred to as a “modified lockdown,” mostly to keep students out of the way of investigators and out of increased traffic in the area. Forensics investigators Monday morning were also scouring and photographing evidence in a lot across the street from the school’s playground, though officials would not comment on whether the two scenes were related. Walker signaled a long investigation ahead, given the extraordinary circumstances. Law enforcement rarely respond to calls other than traffic violations and nuisances in the area, he said. “This case is going to take awhile,” he told assembled media in front of the three-story home where the shooting took place. Investigators are asking anyone with surveillance footage in the area to turn it over to investigators. Those with information about the fatal shooting are asked to call Crime Check at (509) 456-2233. Published: Dec. 16, 2013, 2:21 p.m. Updated: Dec. 16, 2013, 4:53 p.m.